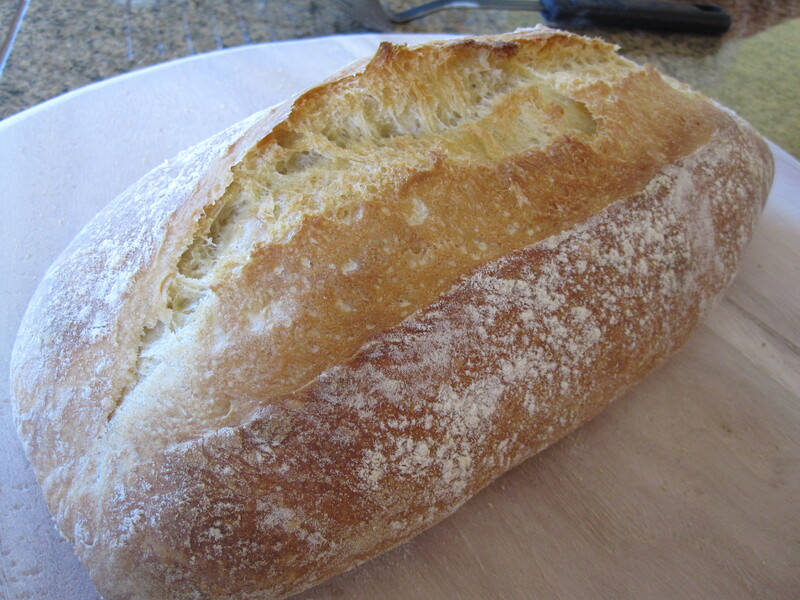 Artisan Bread in Five Minutes a Day is a bread cookbook that doesn’t have tons of pictures. The usual me definitely wont have much interest in it because I just love cookbooks that show lots of colorful pictures. Not only pictures give me the ‘Oh this looks delicious. I’m gonna try it!’ drive, but also serve as reference/guidance to see how well/bad our food turns out compared to the original version. BUT, this bread book caught my attention because of tons and tons of positive reviews. Upon reading I found out this book is written very clearly (this is especially important for artisan bread dummies like myself), and the authors offers lots of tips for baking a good loaf. I was thinking highlighting some important points but gave up, or else I would have to highlight pretty much the whole book! Back to business, this book really lives up to its name– five minutes a day for a fresh loaf of artisan bread. This new approach is totally the opposite of the traditional methods. It doesn’t require starters nor kneading. 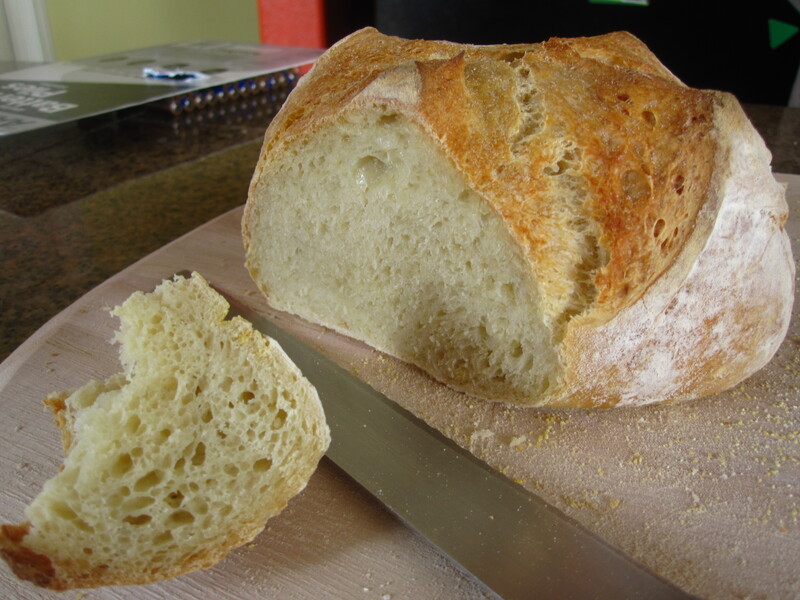 This basic bread recipe calls for very few simple tools and ingredients. You don’t need experience in baking bread either to bake a beautiful loaf. If you’re interested in baking artisan breads and yet don’t want to spend whole day (or even days) making it, I recommend you get this book (or visit their website http://www.artisanbreadinfive.com)– I did and it turns out to be one of my best bread cookbooks! Artisan Bread Basic Recipe: resting dough on pizza peel. 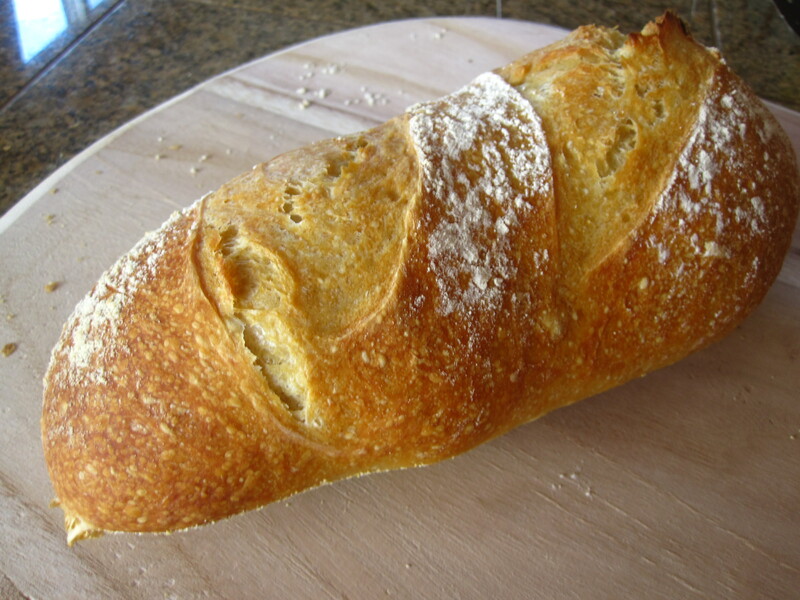 Artisan Bread Basic Recipe: The bread must be cooled completely on rack after removing from the oven. Artisan Bread Basic Recipe: showing here is the crumb (interior of the bread). Another artisan bread from same batch of dough. 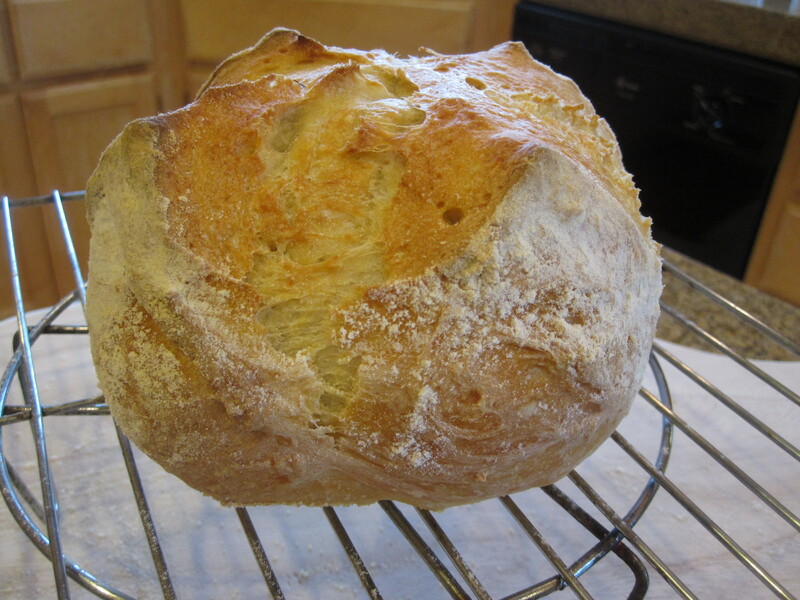 I made this loaf to go with Thanksgiving meal-- same kind of dough, different shapes, but all delicious! 1 tbsp salt— 12/8/10 update: should cut down to 2 tsp as I find the bread is a little salty to my liking. Stir salt into flour to combine. 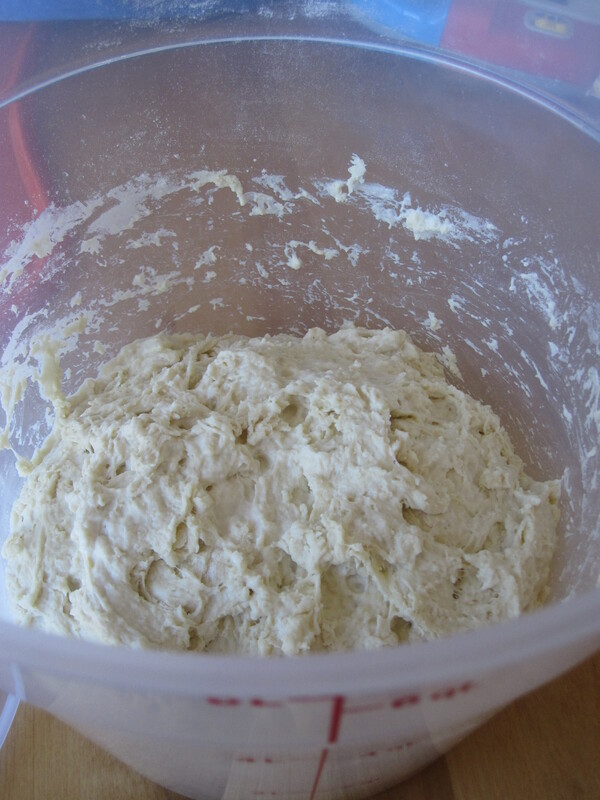 Add lukewarm water and yeast into a 6-quart container, whisk to combine. 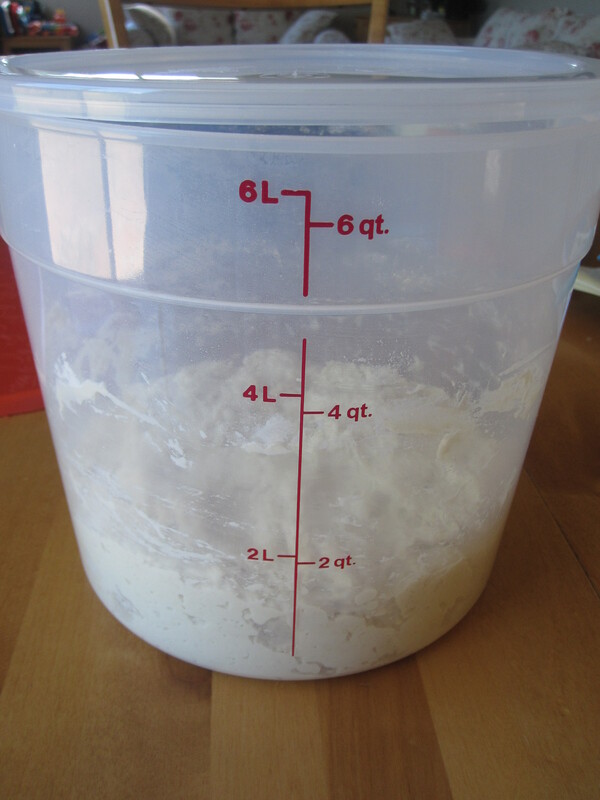 Add flour mixture to the yeast water while stirring using a wooden spoon, until the dough is evenly moist. The dough will look very wet. This should take no more than 5 minutes. Cover loosely with a lid and let the dough rise at room temperature until the top collapse or flat (it took me about 3 hours). Snap the lid on but pull up lid a little so the container is not air tight. Now the dough is ready put into the fridge (the dough is ready for baking after this initial rise but it’s easier to handle after chilling. 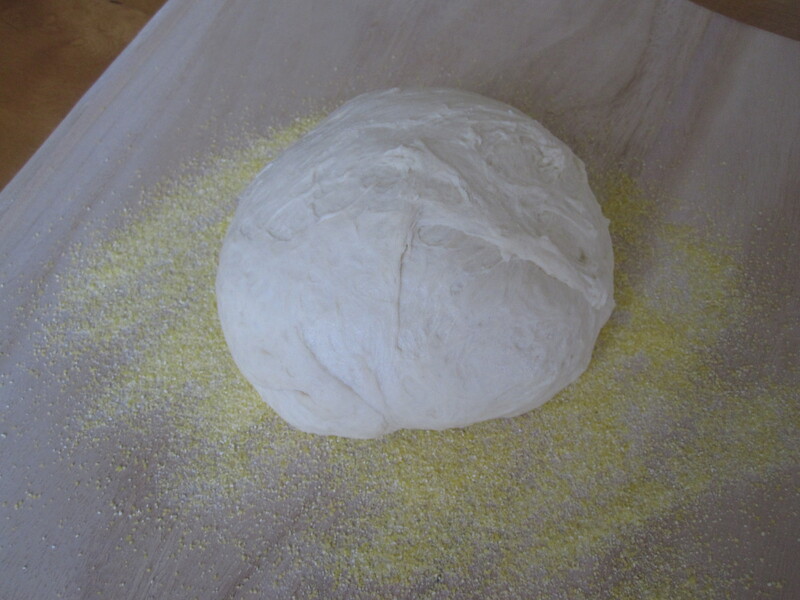 The dough can be kept in the fridge for up to 2 weeks. 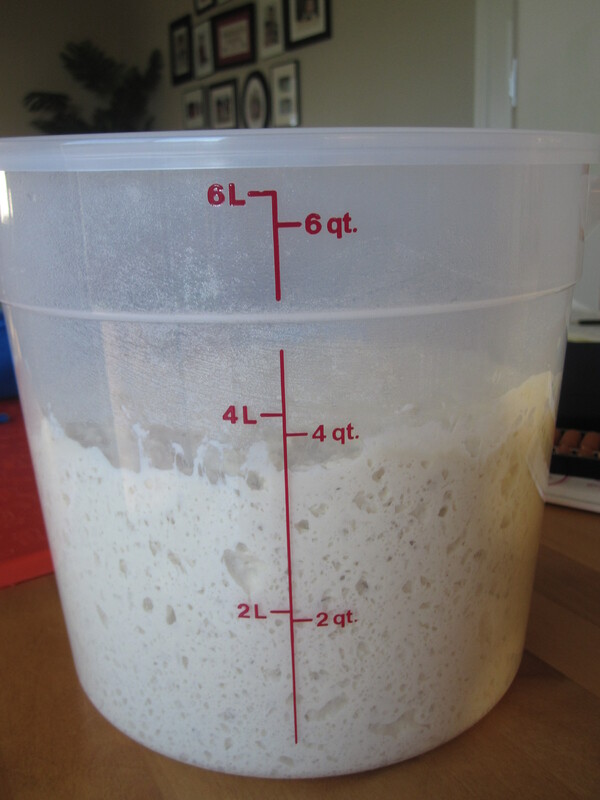 As the dough gets old– especially almost 2 weeks old, the dough will smell sour and the bread will taste more like those of sourdough). Place shaped dough on pizza peel, rest uncovered at room temperature for 1 hour. 20 minutes before baking, place pizza stone on the middle rack and a shadow pan at the bottom rack. Then preheat oven temperature to 450°F. Dust the top of the dough with some flour (so the dough won’t stick to the knife when making slit on the top) and make some slits(1/4 inch deep) on the top. Quickly and carefully slide the dough onto the pizza stone. Pour 1 cup of water into the shadow pan then quickly close the oven door. (To prevent last minute ‘surprise’ of the dough sticking to the pizza peel and losing heat from the oven, I always move pizza peel back and forth to test slide the dough before open the oven door). Bake for 30-35 minutes until the bread is golden and tap hollow at the bottom of bread. Remove bread from oven and cool immediately on a rack. Cool completely before slicing.